I really don't like necklaces. I am not too into the whole chunky, bib necklace that has been so "in". I never really even purchase fashion necklaces. I really just stick to pearls and classic, simple necklaces. Most of the time, however, I don't even wear a necklace. Sometimes, I will whip out bold pearls such as my 5-strand set from J. Crew. However, you can switch it up with just one necklace! This is how they normally look. While I love the look of this, it's good to have a change up and sometimes this doesn't go with all necklines. A simple twist of the pearls and voila! You have a completely different looking necklace that looks much better with the neckline of this button down shirt. This is a headband found at Forever 21 for $6! However, It doesn't work well in my hair so why did I buy it? Because I wanted an "edgier" pearl necklace! The gold chains add a little funk to the normal, conservative/preppy pearls. Do you ever try to change around your costume jewelry? Have you tried to pair your fancy elastic headbands as necklaces or am I just weird? Have a fabulous day! If you follow me on Tumblr, then you have already seen some of these outfits but I thought I'd share them with everyone! This was actually on Halloween so that's why I'm wearing black and orange. This was for a casual Sunday sorority chapter meeting. This was for a long day of classes meetings and library time. 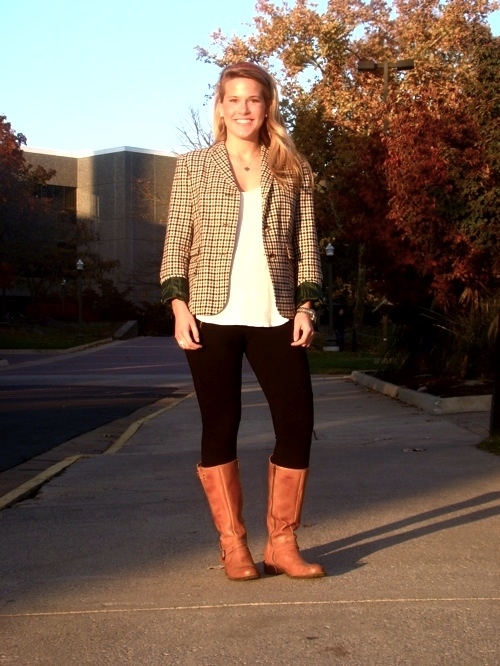 If you follow me on Twitter, then you'll recognize this from my Tweet about me being featured on College Fashionista. A girl stopped me in the library asking me if she could take my picture and interview me! How fun! Here is the actual picture. Credit goes to College Fashionista! I wore this for a presentation that I did on GolinHarris for one of my public relations courses. Here is a close-up of the blazer. I love it! It has grosgrain, crest buttons and a little shine in the fabric! I wore this to the Hunger Banquet. It was a simulation of hunger in the world. It was a really great event put on by one of my sorority sisters. Very well done and shocking to hear in depth detail about hunger in the world. I wore this on a really warm, sunny day to classes. I wore this for a presentation on Pittsburgh-- had so much fun with this speech! Blazer: Forever21 for a steal! What have you been wearing lately? Unfortunately, it's getting a bit too cold now to go without tights in Virginia, but I love wearing tights so get ready for tights and skirts OOTDs to come! Have a fabulous day! It is SO quiet. If you have a roommate this is perfect because compared to any other hair dryer, this one is the quietest I've heard. There is a cold option which I had no idea about or why that's good. But after I'm done drying my hair, I'll turn on the cold and it sets my hair...it really does make my hair shinier. There is a long cord, which is great because I can walk in and out of my bathroom while drying my hair, however, it's a pain to store all of that cord (not a huge turn off though). I've posted before about my hair, here and here and it is easily the most often question asked by readers. I don't really like using product in my hair at all but Misikko sent me some shine serum and it is SO great. It smells good, is really thin so it's not sticky or heavy. I run it through my hair when wet and then blow dry and I am telling you, my hair is so much softer than ever before. I've used it every day since I've received it. I was completely skeptical on how a hair dryer could even do anything differently to my hair and how one could be better than the other. The other day I was walking to class and my hair was just so soft, I asked my roommate to touch it and even she agreed that it was softer. bEw even touched it and agreed it was much smoother. I posted this picture on my blog before, but this just shows how soft and shiny my hair looks. I'm a college student, so I'm not sure that $200 for a hair dryer is in my budget, however, if you have hard to manage hair or very thin hair and can budget for $200, then I can promise you, you will not be disappointed. It will completely change your hair. This is from one of bEw's recent fraternity date functions. This is my hair after hours of dancing (gross)... but still, look how it shines! Here is a picture of me and sorority sister aRs pre-fancy hair dryer. I don't know about you, but I can tell that there is a difference, but that is up to you to judge. Thank you to Misikko for giving me a chance to review the dryer! Have a fabulous day! From my family to yours, wishing you a happy, healthy, and blessed Thanksgiving and holiday season. My sister for getting into her first choice college! I am so proud of her! My mom for cooking such delicious meals while I am home from college and for being a great mother! My blog readers! I love each and every one of you and am so happy and thankful for all of the connections I have made these past 2 and a half years! My new bright red nail polish-- I can't get enough-- It's Sally Hansen Xtreme Wear in cherry red and was only $3 at Walmart (talk about a steal)! The semester almost being over. While I don't want college to end, I am ready to be done with these professors and all of the papers I have had to write. It was easily the most writing I have ever done in one semester. My recently new iPhone that makes connecting easier than ever. My dad's warm cozy sweaters-- I stole borrowed from him. Seriously, wearing over-sized cable knits to lounge in is so wonderful. Having access to clean water and delicious food. After attending the Hunger Banquet event that I recently attended and have mentioned briefly on Twitter has really changed my outlook on life. Of course, I want some of the latest and greatest, but it really makes me realize how luck I am that I have clean water and food because many do not have that luxury. Skiing weather is almost here! Looking forward to staying at a gorgeous hotel to celebrate the end of the semester in Washington, D.C. with my family and friends. Down blankets. They are the best. So much more, I can't even list. So what are you thankful for? What are you hopeful for in the coming year? Wishing everyone a blessed Thanksgiving. Remember to be thankful for even the tiniest of things this Holiday season. I have been so busy between school, spending time with friends, cooking, cleaning, blogging, traveling,etc. that I haven't had time to create a detailed Christmas wish list. However, that doesn't mean I don't have a fun little list in my head that I thought I would share with you! 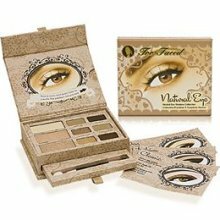 Too Faced Neutral Eye palette. My roommate, jSl has this and I have tried it and love it! I don't like wearing a lot of make up but this has a lot of great neutral shades. Most are great for day-wear but a lot you can mix to make it more night appropriate. If you like doing a smokey eye, they also offer a smokey eye palette along with several other themed eye palettes. The Body Shop grapefruit body wash and body butter. I have never tried either of these products, however, when I was little, we used to have bars of soap shaped like elephants and the soap was this Body Shop grapefruit scent. I am thinking this will bring back memories of being a kid and not to mention it smells wonderful! 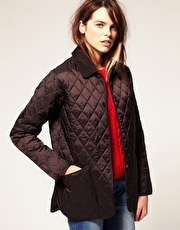 Barbour Liddesdale coat. I would like it in black. This coat is fabulous. In black it an be somewhat dressed up or dressed down. The length is a lot longer than waist-length which I love. Plus, you get Barbour quality for only around $150. I think it is really cute when you see couples out both in their Barbours! KEP Designs B400... If you haven't checked out KEP designs, it is a must. They have gorgeous jewelry. This bracelet is just beautiful! Kate Spade hand in hand bangle. So cute! Love the saying too! Definitely a great thing to give as a gift as well! Scout Deano bag in Deaf Leopard. I've posted how I've just recently been introduced to Scout and how much I absolutely love them. Well, I need the Deano added to my collection! I am going to use it for putting all of my damp ski clothing in it apres ski. The bag is waterproof and perfect for just dumping it out into the washing machine when I return home. Faux fur vest! I have crossed the line from wanting to needing one of these babies. Because I've been at school, I haven't had a chance to try any on but there are a lot of great options at a lot of different price points. Piperlime has some good options along with Nordstrom and Neimans. Swell Caroline monogram ring. Love love love this. It is so unique and fun! Perfect to give as a gift as well. Very inexpensive and a wonderful, thoughtful present. 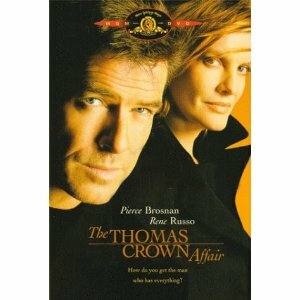 Thomas Crown Affair. I first saw this movie last year and love it! I want to add it to my growing collection. 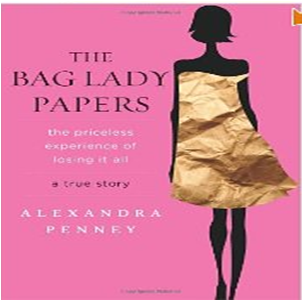 The Bag Lady Papers by Alexandra Penney. This book is all about editor in chief of Self Magazine lost everything to Bernie Madoff. I think this would be an extremely interesting read. L.L. Bean men's plaid button down. I want it to wear on lazy days. It's over-sized and comfortable but still structured enough to leave the house. Kate Spade Larabee dot wallet for iPhone. Love this. I've had my eye on this for a while. So functional. Remember it from my post last Thursday? What are some things on your Christmas wish list? Have a fabulous day! Congratulations to SSC and Hannah! Both of you are the lucky winners of a Lemon and Line bracelet of your choice. Please contact me at SummerWind41490@gmail.com so I can get you in touch with Lemon and Line! No worries if you didn't win! More giveaways to come soon! Last Thursday I attended the Preppy: Cultivating Ivy Style event at J. McLaughlin's Georgetown store.Needless to say it was fabulous. Not a detail was overlooked and there were lots of people there to mingle with! I even spotted Carly @ College Prepster and Stephanie @ Prepfection. It was so much fun getting to meet bloggers in person and chatting with them. I got the great pleasure of meeting Jeffrey Banks. He signed my copy and chatted with me for a while while wearing some great J. McLaughlin pieces (for men, I love their gingham shirts). I loved the tie display. There were so many to choose from. I can't help but to be drawn to ties. The plaid ones were my favorites for this holiday season. While there, bEw and I ran into some friends. On the left is his roommate from boarding school, W, and to the right is one of our college friends, T, who graduated last year! They had the best time sampling all of the delicious hors d'oeuvres and bEw spent a little time hinting about what he'd like for Christmas. Speaking of hinting at Christmas. I am hoping that come Christmas morning, one of these pretties will be sitting under the tree! Another great treat was that they had individual Georgetown Cupcakes for each guest! I had to eat mine almost as soon as I left because it was so yummy! I also had a great chat with Mr. Steve Siegler. who is the President and CEO of J. McLaughliln. He gave me some more information behind the J. McLaughlin brand. A fun fact is that J. McLaughlin's first store was opened in 1977 and they now have over 45 stores including ones in Palm Beach, Florida and Winnetka, Illinois. All in all, it was a wonderful event and I hope that there are more to come in the future! Have a fabulous day! Is your beau in need of something to wear for this holiday season? I cannot get over how cute these bow ties and cummerbunds are from Just Madras. Students traveling home or anyone traveling for Thanksgiving break today or sometime soon, wishing you a safe and happy trip home! 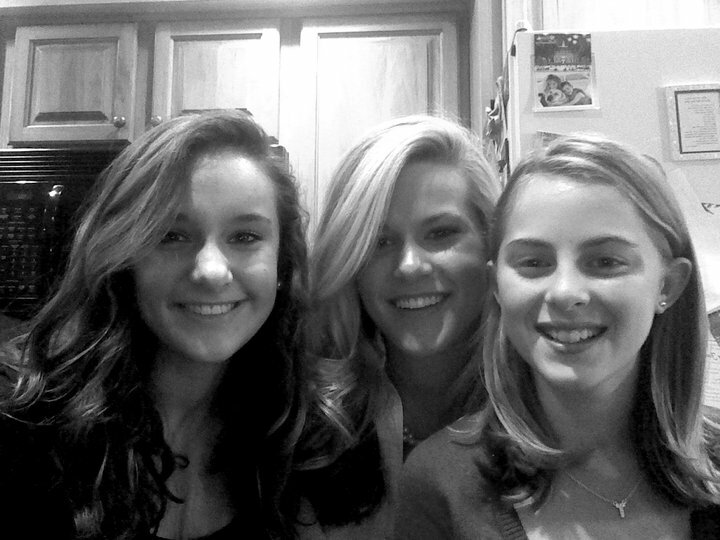 Today I am thankful for being home with family and friends! Happy Friday! Have a fabulous day! So I recently converted to the iPhone and have been racking my Christmas list with iPhone accessories. 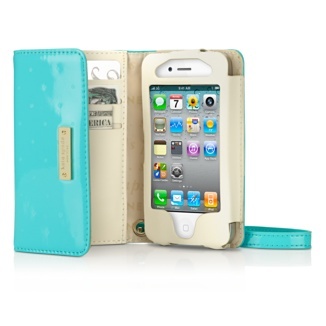 I have a fun blue case that I bought when I got my phone, but I've been searching for something really cute. I dislike the Lilly cases because they are cheaply made and the color wears off. I also think that the monogrammed cases are really cute but they are very similar to the Lilly cases and the color chips. Not to mention that I feel like everyone has the monogrammed case. So here is the top contender on my iPhone accessories list. It's mad by inCase and is only $35! I have never seen anyone with this case before so it's unique but also really cute! I also want this Kate Spade Larabee wallet to change it up. It's perfect for me because I am always on the go and running errands. Plus, it's nice and small and will fit in most of my handbags. I also love this Graphic Image leather iPhone case. It's very simple and sophisticated and definitely a quality item that will last probably as long as my iPhone. This Horchow case is a little on the pricey side, but it is so fun and of course, anything that can be monogrammed is great in my book. This J. Crew case is very simple but fun. It shows you have a sassy side! The best part is that it's only $25. Who makes your favorite case? Why do you love it? Do you recommend a certain case? I'd love to know! Have a fabulous day! Don't forget to enter to win the Lemon and Line bracelet giveaway! Are you attending the Preppy: Cultivating Ivy Style book signing at J. McLaughlin tomorrow night at their Georgetown store? I will be in attendance and would love to know if any of you will be there so I know to look for fellow bloggers (if you are attending, comment or e-mail me at SummerWind41490@gmail.com)! I am SO excited-- I hear it is going to a fabulous time. It is from 6-8pm in the evening and the J. McLaughlin holiday 2011 line will be on display.You will also be able to meet authors of this gorgeous book (seriously, I have had my book since it came out and I can't put it down with all of the gorgeous images!). I needed to share one of my favorites of their Holiday look book. The above clutches are SO perfect for the holidays-- I have the ribbon clutch in multi-colored so it is more of a summery style but I love it! Plus, I am dying for the sequin skirt (I'm thinking this is a great NYE option). There is not a single thing that I would change about the women's outfit on the right. That skirt is simply to.die.for. 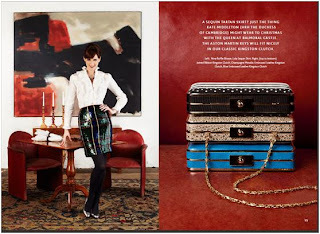 What are you loving from J. McLaughlin's Holiday 2011 Look Book? Do you love Preppy as much as I do? Hope to see some friends at the event tomorrow night! Have a fabulous day! With Thanksgiving just around the corner, it's time to prepare our stomachs for all the food we're going to eat, but also a fun outfit for the occasion. We always have Thanksgiving at my house and lots of family come to stay for the holiday. The dress is somewhat casual but I love coming up with clever ways to bring the fall and upcoming Christmas colors into my wardrobe. I love the outfit on the very right. I have several dressy taffeta skirts and I love to dress them down by pairing the skirt with a plaid button down or oxford cloth shirts and flats. That way, you won't look too overdressed and you can get more wear out of your dressier skirts. I have written about getting plaid shirts and oxford shirts from the boys section of Brooks Brothers and Ralph Lauren. It's the best way to go because they have the best selection of plaids (way better than the women's sections) and they are also less pricey. The second outfit from the left is another fall/winter staple look that I love. Pairing a crew-neck cable-knit sweater underneath a blazer is a great way to stay warm and also look put together. My favorite cable-knits are Ralph Lauren. I have several in wool and a few in cashmere-- I find that they are the best fit and have the most diverse selection of colors. What are you wearing for Thanksgiving? Do you get dressed up or are you dressed more casual? I will post my Thanksgiving outfit in an OOTD sometime after Thanksgiving! Remember to enter the Lemon and Line bracelet giveaway! Have a fabulous day! Congratulation,s kBr! Please e-mail me at SummerWind41490@gmail.com to claim your prize! For those that are bummed, there are two chances to win this week with the Lemon and Line giveaway! These are the Nantucket collection in Navy, Green and Yellow. My personal favorite is the yellow because it matches the most in my closet. 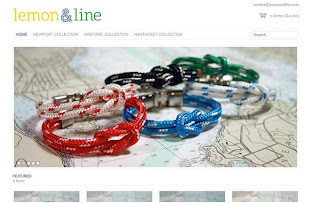 Other than the Nantucket collection there are several other collections to choose from such as the Newport Collection and the Vineyard Collection. At $25, these would make a really fun and inexpensive gift. My roommates and I discovered that you can actually take the bracelets apart. They come into two pieces and then you can mix and match colors which is really neat. I think it would be awesome if you went to, say, Michigan and got a navy and a yellow and mix and matched them for a school spirited bracelet! We loved pairing the navy and green together. These bracelets come in several sizes. There is a size chart so you can decide which size you are. The two bracelets that are being given away are a size small. The small fits my wrist just fine and I would say I have an average-sized wrist. If you want yours to fit more along the bangle side of a bracelet, then I would size up one. So, how can you win one of these pretties from Lemon and Line? The giveaway will end on Sunday November 20, 2011 at midnight. TWO winners will be announced shortly after! Good luck to all! Have a fabulous day!